Helicopters have been around in India for a long time, but they have always grown in the shadows of other types of aircraft, be it a commercial airliner or a private aircraft. In fact, the growth has been woefully poor compared to the potential it has. One of the major hindrances in their growth has been the lack of proper infrastructure for the rotary-wing segment. While the helicopter can land and take-off from a small piece of land or from a large rooftop adding to its versatility, for regular operations, it requires proper infrastructure for the segment to grow in an organised manner. One of the key essentials for the growth of the helicopter segment is the existence of heliports and that concept never existed in India, till recently. A heliport is by definition an area of land, water or structure used or intended to be used for the landing and take-off of helicopters and includes its buildings and other facilities. In other words, it is a small airport suitable for use by helicopters and some other vertical-lift platforms. Designated heliports typically contain one or more touchdown and lift-off areas and may also have limited facilities such as for storage of fuel, refuelling of helicopters and hangars for maintenance. In some larger towns and cities, customs clearance facilities may also be available. Centrally air-conditioned passenger terminal building with the capacity to handle 150 passengers. Four hangars of 3,600 sq m area (each hanger with 900 sq m). Parking capacity for 12 helicopters. The Rohini Heliport can be used for 25 operations so far by various operators. It is the first integrated heliport which is expected to further boost the plans of the government to increase remote and regional connectivity through air. 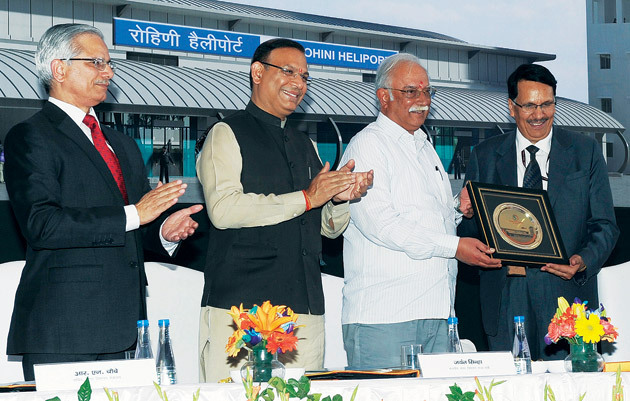 Inaugurating the heliport, Gajapathi Raju said that the heliport was an excellent infrastructure but pointed out that helicopter services in India are still at a nascent stage. The facility will keep the cost under control as MRO facility has been incorporated. This would also help in job creation. Raju also said that his Ministry has made a request to the Lt Governor of Delhi as well as the Delhi Government for providing Pawan Hans Limited., the adjacent two hectares of land for setting up helicopter pilots and an AME training centre to meet the growing demand for such professionals. The Minister of State for Civil Aviation, Jayant Sinha, said that the aviation sector is making history almost every day and that the heliport is one such event. He said that the facility will be useful in providing medical emergency services, public safety and enhancing tourism. Sinha said that helicopter services could become economically viable if the prevailing 25 per cent tax on aviation turbine fuel was reduced. The Secretary for Civil Aviation, R.N. Choubey, said that it is part of the National Civil Aviation Policy (NCAP) to have four heliports, one in each region and Rohini is the first step. 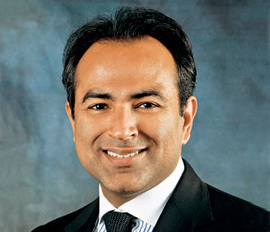 He also said that helicopter operations could be shifted from the Indira Gandhi International Airport (IGIA) to Rohini. The heliport was completed in almost two years time at a cost of nearly Rs. 100 crore. This heliport will provide all helicopter operational facilities and will decongest the busy IGIA and also promote regional air connectivity through helicopters in the northern part of the country for regular passenger services, heli-services, landing and parking of helicopters, MRO services for helicopters, disaster management, Helicopter Emergency Medical Services (HEMS), law and order surveillance. Pawan Hans has also prepared a road map to connect all the major destinations from this heliport such as to Shimla, Haridwar, Dehradun, Mathura, Agra, Meerut and industrial hubs such as Manesar and Bahadurgarh. They will provide air connectivity between Delhi and neighbouring cities from the heliport. With the heliport commencing operations, regional connectivity will become easier from the capital to neighbouring areas. Pawan Hans had successfully carried out trial sorties from the heliport in February last year and had planned to go for full-scale helicopter operations from May. The commencement of services from here is also expected to reduce congestion at the Delhi airport, which currently handles about 50 helicopter arrivals and departures on an average per day besides the large-scale fixedwing operations, the Chairman and Managing Director of Pawan Hans B.P. Sharma said. Pawan Hans is working on its business diversification and has devised a Strategic Plan 2020 according to which company will be diversifying into small fixed-wing and seaplane operations, MRO and development of helipads and heliports. It is working to develop four ‘heli-hubs’ in line with the concept of ‘airport-hubs.’ These helihubs will be a one-point solution for the helicopter business and will act as a heliport for public passenger services, MRO facility for helicopter maintenance and also as a skill development centre for training of pilots, aircraft maintenance engineers and technicians. 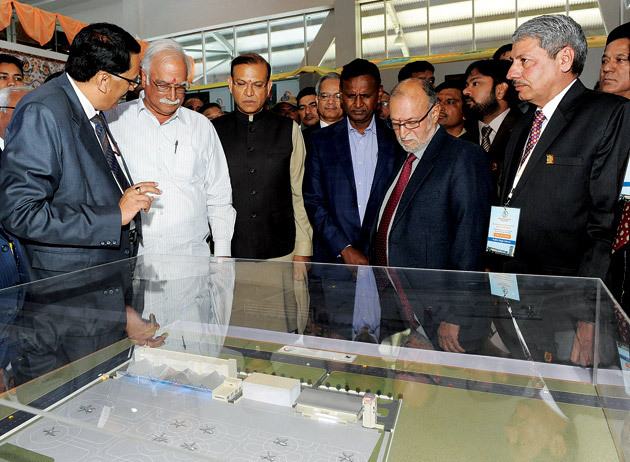 Union Minister for Civil Aviation, P. Ashok Gajapathi Raju watching the model at the dedication ceremony of the first integrated heliport at Rohini Heliport in Delhi on February 28, 2017. The Lt Governor of Delhi Anil Baijal, the Minister of State for Civil Aviation Jayant Sinha, the Secretary, Ministry of Civil Aviation, R.N. Choubey and the Member of Parliament Udit Raj are also seen. In the NCAP, there is provision to develop four heli-hubs in the Northern, Southern, Western and Eastern regions and Rohini is the first off the block. The MoCA has launched a Regional Connectivity Scheme under NCAP which inter-alia permits helicopter operation only among the states of Jammu and Kashmir, Himachal Pradesh, Uttarakhand, North-eastern region of India, Andaman and Nicobar Islands and Lakshadweep Islands. Helicopters play a key role in remote area connectivity, intracity movement, tourism, law enforcement, disaster relief, search and rescue and emergency medical evacuation. India currently has less than 300 civilian helicopters which is very low as compared to other developing nations. Separate regulations for helicopters will be notified by the Directorate General of Civil Aviation (DGCA) after due consultations with stakeholder. The government will facilitate the development of at least four heli-hubs initially across the country to promote regional connectivity. The MoCA will coordinate with the Ministry of Finance, Ministry of Home Affairs, National Highways Authority of India, Indian Railways, insurance companies, hospitals, Pawan Hans and other helicopter operators to facilitate HEMS. The DGCA will bring out regulations exclusively for HEMS, which will stipulate that helicopters under HEMS operations shall not be used for any other purpose. Such being the case, helicopters under HEMS operations will not require any operational clearance from any agency for landing at accident sites or in the event of any other emergency except air defence clearance because of the very nature of their operations. No landing charges and RNFC will be levied for HEMS operations. Helicopters will be free to fly from point-to-point without prior ATC clearance in airspace below 5,000 feet and areas other than controlled airspace, prohibited and restricted ones, Temporary Segregated Areas and Temporary Restricted Areas after obtaining air defence clearance, wherever required and intimating the following information to the nearest ATC: point of origin, destination, level, expected time of departure, expected time of arrival and the duration of flight. For this, the Ministry of Defence and MoCA will set up web-based platforms. The Airports Authority of India (AAI) may provide or earmark/lease land for helicopter operations at AAI airports on appropriate commercial terms from where helicopters can operate without interfering with fixed-wing traffic. Airport charges for helicopter operations will be suitably rationalised. A separate helicopter cell will be created in DGCA. The Ministry of Defence, through the Indian Air Force, will create a system whereby expeditious air defence clearance may be granted. A beginning has been made to develop the rotary-wing segment in an organised manner and it is now for the industry to rally around such efforts by utilising the heliports and heli-hubs which are soon going to dot the nation.